My wife cooked Menudo for Jo-Lo's birthday party and this was a big hit. The guests loved it so much they took some home with them when they raided the kitchen and discovered that there were still some left in the pot! 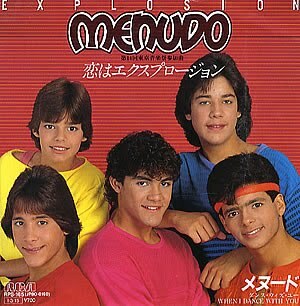 Menudo inherently comes from our Spanish heritage (this dish, and the 80s boy band of the same name). We have adapted this dish to our taste and is one of the more popular items in the Filipino menu. 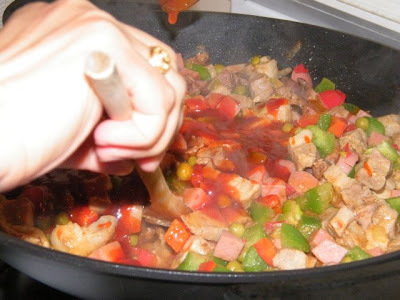 Our version is different from the regular menudo recipe in that we used banana ketchup instead of tomato sauce. Also, pork liver is hard to come by here and so we used chicken liver instead. Heat up a pan over medium heat and place cubed pork, spread out on the pan's surface. Add enough water to just submerge the pork halfway. Let the water boil uncovered. 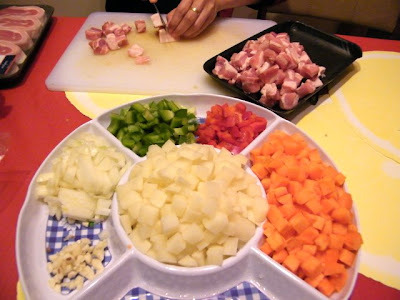 Stir occasionally to cook the pork bits on all sides. Eventually all the water will evaporate, and this will be replaced by the pork releasing its own fat. Reduce the heat if needed to avoid the pork bits from getting singed, mixing constantly. Add cooking oil if needed. After around 5 minutes, remove the pork from the pan, retaining the oil. Add the potatoes and carrots into the pan, mixing occasionally. Test if the potatoes are cooked by piercing a piece with a fork. If you are able to piece through with a bit of resistance, then it's ready. We do not want overcooked potatoes that would crumble easily. This will take around 7-10 minutes. Remove potatoes and carrots from heat. Saute the onion and garlic. Add the cooked pork bits and the chicken liver and the hotdog slices. 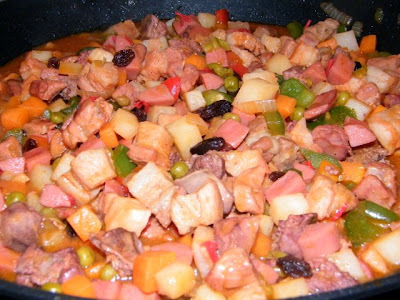 When the liver is cooked (it will change to a lighter colour after a couple of minutes), add the capsicum / bell peppers, raisins, and garbanzos, and the cooked potatoes and carrots. Add the ketchup and mix. Put in a couple of tablespoons for starters. Mix and taste. Season with salt and pepper (and some more ketchup if desired). And there you have it: Menudo!